Taming the Big Bag of Stink! — welcome to the Good Sport! Taming the Big Bag of Stink! Nothing can make my stomach turn faster! I don’t think that I can think of anything that smells quite as bad as my son’s lacrosse equipment bag. From a design standpoint, the packaging is homegrown in appearance. However if you come from the school of, “Anything that looks this bad has to be good,” you will surely be attracted to the product. 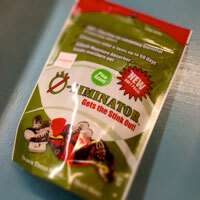 Each foil pack (sells for $12.95) contains 2 O-Liminator packets. I placed both in the bag, hoping for super-duper-double-action and have been extremely pleased. Sure, the fresh pine scent is more lumberjack than lax player, but this is not necessarily a bad thing. Trust me. – Doug. ← Spikeball: New England, Harvard, The Good Sport!